Exploring the ramifications of Bruce Wayne’s marital misfortunes experienced the issue prior, author Tom King showcases an emotionally unhinged Caped Crusader in Batman #51. 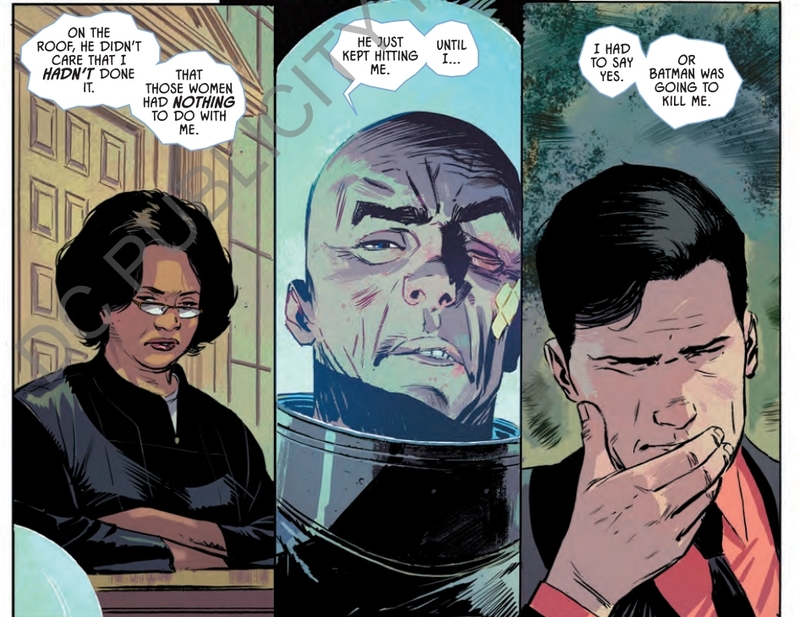 Opening a new storyline, “Cold Days,” the Lee Weeks-illustrated, Elizabeth Breitweiser-colored issue portrays Bruce Wayne as a juror for the trial of Mr. Freeze, charged with a triple homicide. This is contrasted by parallel scenes of an enraged Batman brutally beating a potentially forced confession out of Freeze in the incident which lead to his arrest. In panels reminiscent of Spider-man’s wrathful periods in his black suit, Batman mercilessly pummels Mr. Freeze, inevitably leaving the unconscious criminal with a batarang calling card embedded in his face, evoking a much-maligned scene from the film, Batman V. Superman, which showcased an older, hardened Batman branding criminals with his symbol, breaking traditional characterization. However, contrary to its film contemporary, the scene included this issue illustrates how Batman’s aggravated assault is a notable departure from his standard behavior, and part of an emerging emotional breakdown, unlike Batman V. Superman, which established it as the norm. Mention of the batarang perforation is notably absent from the testimony of arresting officer, Harvey Bullock; a character renowned for his past moral improprieties. In additional testimony, Commissioner Gordon takes the stand attesting to evidence gathered by Batman in his autopsies of the three victims. Freeze’s defense attorney decries said evidence as illegitimate, as Batman has not been licensed to assist the Gotham City Police Department (GCPD) on autopsies, or in any other official capacity. Highlighted in these testimonies is the illicit nature of Batman’s war on crime, and the GCPD’s complicity in his actions. Similarly, when the jury convenes and uniformly condemns Mr. Freeze as guilty--with the sole objector being Bruce Wayne--the rationale for their decision is shown not to stem from the presentation of evidence or witness testimony, but from how Batman’s past actions have helped keep them all safe, and thus imbued them with an implicit trust in their city’s protector. This illustrates how the people of Gotham too are complicit in Batman’s unchecked actions. Lee Weeks’s art animates the issue, breathing life into the trial through his masterful face work. From members of the jury to Freeze himself, Weeks’s work registers the characters as real people. His lines paint the characters’ expressions to depict a wide variety of emotions, ranging between easily conveyed affectations such as pain and anger, to more subtle depictions, such as disdain and remorse.